Sportscaster Erin Andrews will soon find out whether she is to be compensated by a Nashville hotel for the pain she's endured since she was filmed naked in 2008 by stalker Michael David Barrett through a peephole. On Friday, the case was thrown into a jury's hands upon the conclusion of closing arguments. Andrews is demanding $75 million in damages against West End Hotel Partners, the owner of the local Marriott near Vanderbilt University, and Windsor Capital Group, the company that managed the hotel. She alleges both were negligent for their behavior letting Barrett so close to her. Barrett, who pled guilty to interstate stalking charges in 2009 and was sentenced to 30 months in prison, took video that's now been estimated to have been viewed by some 17 million people in the past seven years. 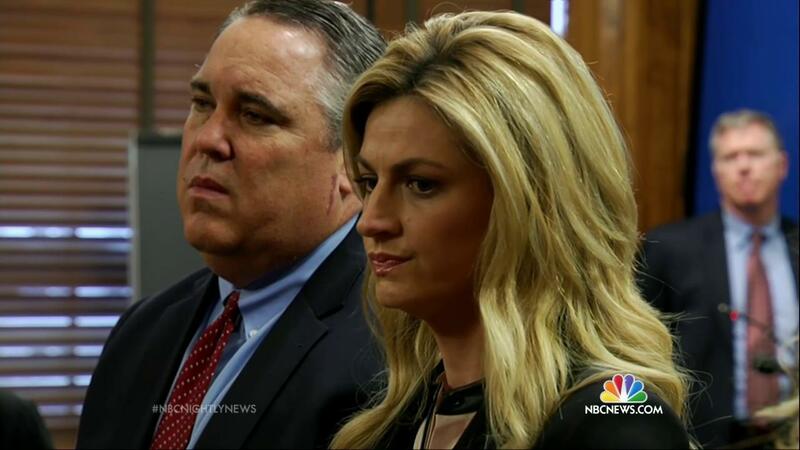 "I think we've proven overwhelmingly that they knew the dangers associated with telling someone that Erin Andrews was at the hotel and secondly, putting someone next to her room without telling," said Andrews' attorney Bruce Broillet in closing arguments. "Remember what Erin said: If she had been told that a strange man was next to her, she would have gotten out." During the trial, Andrews (formerly at ESPN, now at Fox Sports) gave emotional testimony about what she's put up with since 2008. "The front page of the New York Post said 'ESPN Scandal.' To Fox News and CBS, everybody put up that I was doing it for publicity and attention, and that ripped me apart," she said, adding that her bosses made her give an interview about her ordeal. During closing arguments, Broillet portrayed Andrews as someone who "doesn't believe in celebrity for celebrity's sake," that despite being the kind of attractive woman who he personally could never have gotten a date with, she's always been modest about her body. He also attacked defense attorneys who cross-examined Andrews this week about the way her career has flourished in the past few years. "Why did they put those photos in front of you?" he asked. "They threw those photos of her from Dancing With the Stars to try to make you think that being naked isn't killing her every day. Don't let them get away with it." Broillet said Andrews is "suffering post traumatic stress disorder where there is no post. People are looking at her on the internet every day. She gets catcalls every day." In response, during arguments on behalf of the hotel companies, attorney Marc Dedman told the jury, "What he is doing is tugging on your sympathy. We concede that Ms. Andrews is a victim of a disgusting crime by Barrett... The way that counsel presents the Nashville Marriott is that nobody would want to go there...But this is the score that this hotel got just three months prior to event. They got 100 percent on life security and safety." Dedman pushed off blame, mostly to the stalker who he said is ultimately to blame for what happened, but also to Marriott International who handled the reservation of Barrett's room. (Marriott International was dismissed from the case at an earlier stage.) He also attempted to sow doubts on the foreseeability issue, saying that there's no proof that the hotel put profits over security and that Andrews herself testified that she could have never envisioned this happening to her. Plus, he said that Barrett's videotaping of Andrews was "one act," and that further distribution was another. "Was that foreseeable?" Finally, he turned attention to Andrews' request for compensatory damages and the issue of what happened to Andrews' career -; the subject that has gotten much of the media attention this week. Some have accused the hotel of blaming the victim. Why point out that she's gotten all sorts of new fame and that her pay has increased since the incident in question? "It wasn't to say it benefited her," he argued. "It's just to say there wasn't a significant injury."